Marvel Comics is thinking hard about live-action TV shows based on its characters. Here's hoping they're better than the lame 1970s TV movies that were made. Marvel Comics has definitely become an entertainment powerhouse over the last decade. Between the movies, the cartoons, and the videogames, it's safe to say that Marvel's successfully recovered from the Chapter 11 bankruptcy it had to file for in the 1990s. However, one area of the entertainment business that the publisher hasn't had much of a recent presence in is live action television (aside from Blade: The Series). From the sound of things, though, that might be changing in the near future. "We didn't have a television network, and now we do. We're part of ABC, ABC Family, and ABC Studios, and Disney XD. We're part of a bigger family. This opens us up to so many, many incredible ideas and creators that want to work with us, not just in comics or animation or film, but now also in television. "We're talking to some people, we have some great ideas, [and] we want to make sure that whatever we come out with first, whatever we decide to come out with first, is explosive and just has everyone smiling from ear to ear and saying that is quintessentially Marvel. "Anything and everything is on the table. We're thinking about every possibility for Marvel." Marvel's acquisition by Disney seems to have been a relatively eventless development so far, so it'll be interesting to see if the two groups end up working together on a live-action show (which is something Disney loves to do). 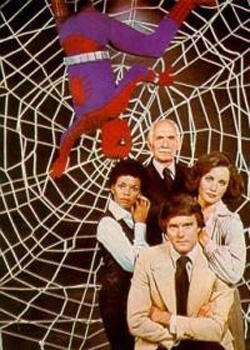 If something like this does come about, hopefully it won't be as hokey as the 1977 Spider-Man TV show on CBS.